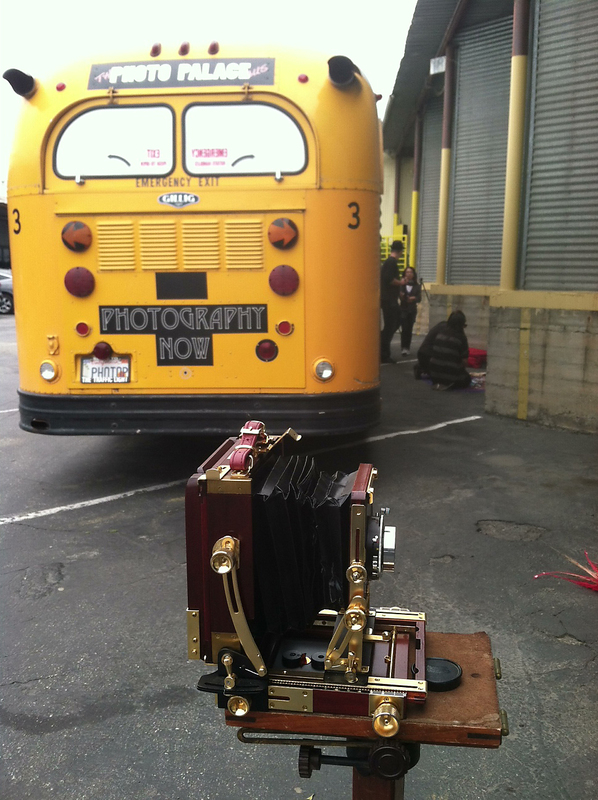 The Photo Palace Bus is a project dedicated to the art of analog photography. 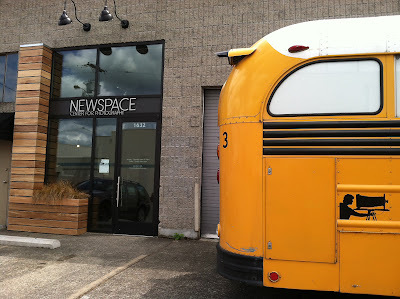 Darkroom and presentation area are housed in a 35ft school bus and offer a range of educational and artistic opportunities. After seeing the sunset in Spokane and making the above plates I drove east until I reached Post Falls Idaho. There I filled up with diesel (which is a bit cheaper in ID than in WA) and found a dead end street that I thought I wouldn't be bothered on if I park there for the night. It was out of the way, behind an industrial park and close to a river with only one house farther up the road visible on GPS satellite image. I actually did some varnishing starting at 1am and so I didn't get to sleep until about 2:30. I like to keep on top of the varnishing process not only because it will prevent my plates from oxidizing, but also because it's quite a time-consuming process in itself, and if I were to fall behind on it and collect more than 10-15 plates it would take forever and a half and I'd inhale more alcohol fumes than I really would like to. Unfortunately my calculation about the street being quiet didn't pan out and at 6am exactly someone drove by at high speed while blasting electronic music like it was a mobile rave or an art car at Burning Man. I tried to go back to sleep, but not 5 minutes later they drove back with the same song still on and after that the sun was starting to hit the windows and it became too bright to sleep. I like to get more then 3.5 hours of sleep per night, but what's a guy to do? I decided to explore the town where I ended up in, especially considering that my trek through Idaho was not going to be too long - I-90 goes right through the skinniest part of the state and if I didn't stop I could have been done with the whole state in 1-1.5 hours. Upon taking the side streets I found the following scenes right by a mill. The camera has to be set up for a while, so a manager came out and asked me how come there was a camera pointed at 'his building'. Apparently he thought I was an environmentalist of some sort and that I was collecting evidence... I asked him if they were polluting and he said they didn't. I didn't have time to do a full inspection and neither am I qualified to do that, so I had to take him at his word on that fact. The tintype of the building actually came out really great - one of the best tonal ranges I have gotten so far. I wasn't done with the area just yet and, wanting to see what river life was all about, looked up a street that goes by the water. The street turned out to be a gravel private one, but there was no way to turn Gilli around and so I had to creep by the really nice waterfront houses at 5 miles per hour as the handwritten sign at the beginning of the private part requested. It being a private street I felt like I should ask someone if I could set the camera up on their property, so I stopped at a boat repair shop thinking that they would be OK with me walking out on one of their many docks. Not so. Apparently it's too much to let someone make art on their property. As I drove away I got a phone call and paused to talk with my engine still running. A nice old lady popped out of the house in front of which the bus was idling and after explaining what I do and why I'm on a private road (not being able to turn around was my excuse), she let me park by her garage and use one of her docks to make the following two exposures. After those I felt that Post Falls has been explored enough and got back on I-90. 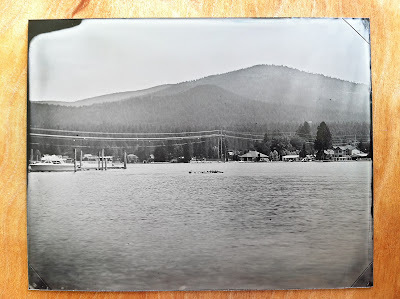 Not far was a beautiful lake by the name of Corte d'Alene. I had a great chance to gaze at it because the highway makes a pretty steep climb and I was going about 30mph. On the slope down I was picking up speed, but still looking at the lake with the corner of my eye. To my surprise and delight I saw a very cool looking statue of an old-western looking photographer with a large format camera. 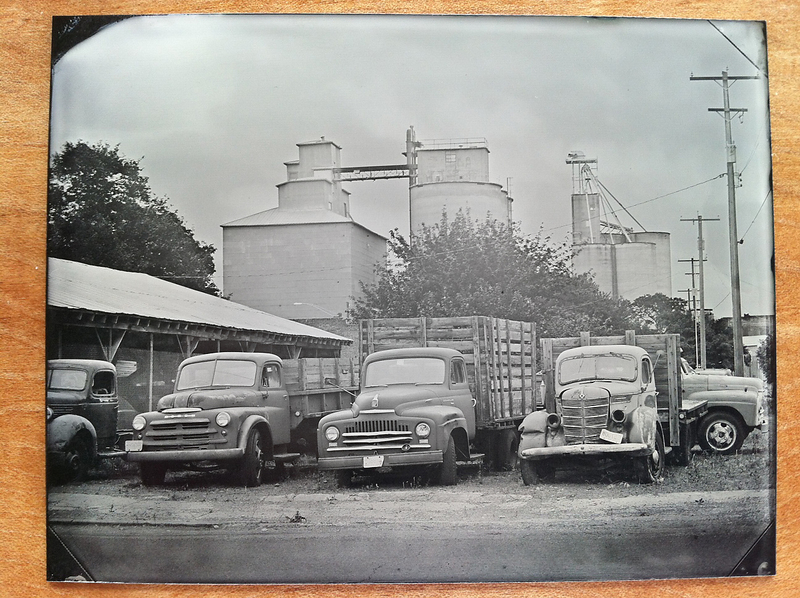 I knew I had to stop and make a tintype of that. What followed was a serious effort to get the plates. First off, as I mentioned, there was a good hill that I just got over and I didn't remember seeing an exit right on top of it. The next exit was about a mile and a half down the road and after taking it I pulled over to see how I'm going to get to this statue. The previous exit was indeed all the way back over the hill and quite a ways back, so I decided to take a side road that wound around on the other side of the highway and eventually seemed to pop right out by the lake again. Just my luck - the road turned out to be a mountain dirt road! Gilli took it rather well and I got to see some great property lots for sale and a few castle-like cabins on those lots that have already been sold. When I got to the paved road that runs around the lake, which I thought would lead me to the statue, there was a sign proclaiming that the road ended in 2 miles. I wanted to know how close to the object of my photographic desire those two miles would take me. The road ended in a large parking lot and the statue was nowhere in sight. There was a foot and bike path that went on from there, so, having already gone this far I parked and walked on to find the darn thing. I found it, but after looking back I thought to myself 'is it really possible to make a wet plate image with a darkroom being about a quarter of a mile away and it being about 80°F outside and what felt like 10% humidity?'. I was not going to give up easily though. Walked back to the bus, set up the chemistry, got the camera, walked to the statue, set up the camera and took this shot. Outlined in red on the right side of the frame is the roof of Gilli-the -darkroom-bus. By the time I got to the darkroom the thermometer there read 90°F. 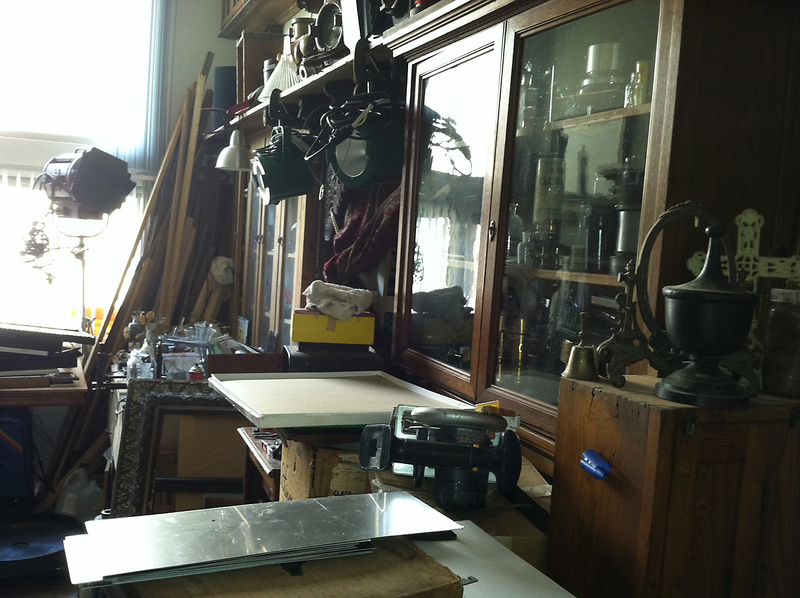 Even before finishing the collodion pour I was sweating like I just ran a mile at full speed. While the plate was being soaked in silver nitrate I changed my jeans to shorts, shoes to shorts and took off my shirt in preparation for a run. I also prepared a plastic bag with water-soaked paper towels to keep the holder cool and in humid condition in hopes that it would keep the plate from drying. I don't run very often. I am a firm believer that we as humans were designed to run at full speed only in times of danger and even then only to a nearest tree that we can climb on, but this time I did run like there was a tiger chasing me and the camera was my safe zone. This run was up a slight incline and by the time I got to the camera I was starting to shake a little, but managed to unwrap the holder from the wet towel, stick it in the camera and press the cable release. 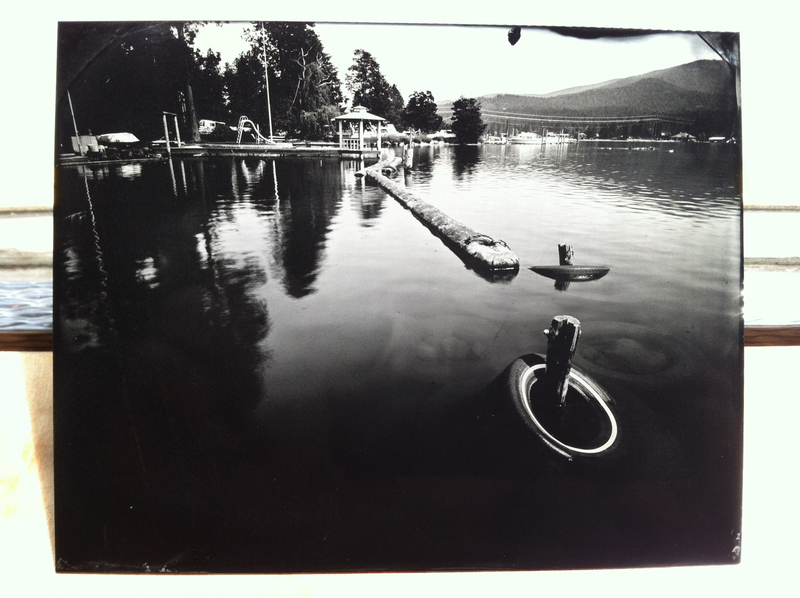 After wrapping the holder back in the moist towel I darted back down and dove into the sauna/darkroom. 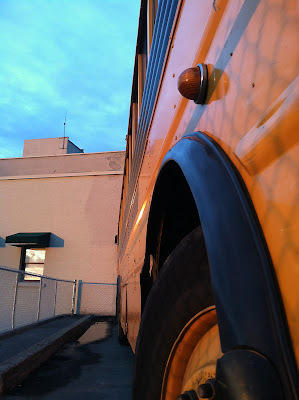 When I ran out to the camera I actually started a timer to see how long it would take me to get back and when I got back to the bus I saw that it's been 3.5 minutes. 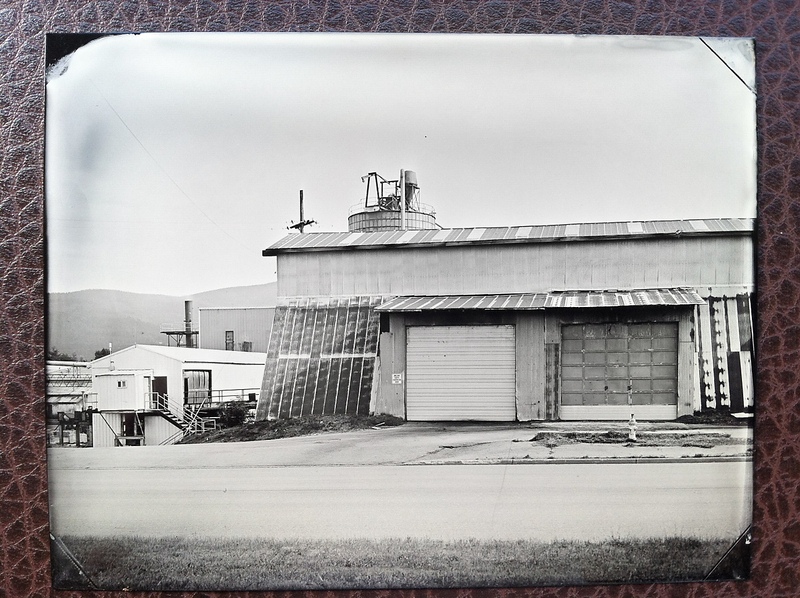 The plate was as dry as I have ever seen a 'wet' plate prior to development, so I was not sure if my efforts were about to be annulled completely. As I was pouring on the developer my hands were shaking a bit and the dim red light seemed even dimmer than usual. Nonetheless I watched closely as an image started to form and was happy to see that detail is starting to appear. I actually had to add some developer because, either from the heat or from my hands trembling, by the 20 second mark there was no visible pool of it left on the surface. I think 30 seconds was the time I gave this plate and it seemed like the longest 30 seconds ever. 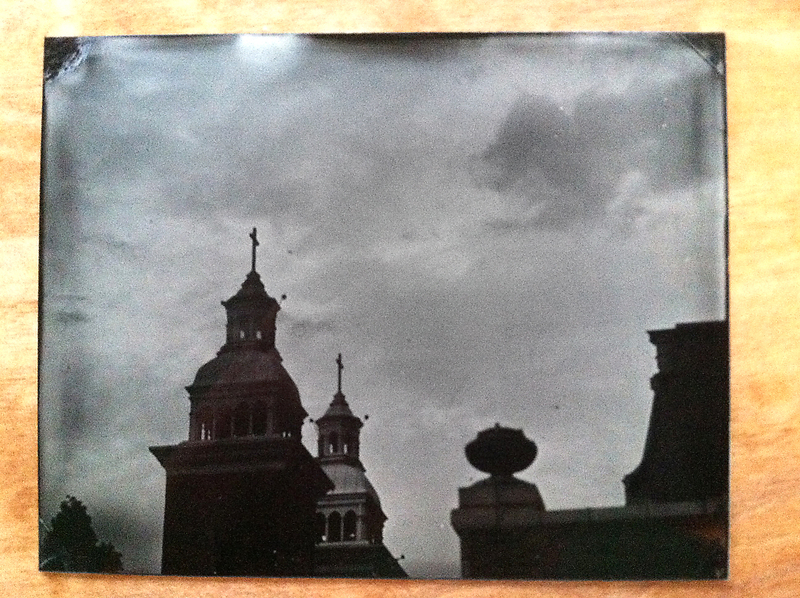 After I rinsed and fixed it I thought that it was about 1 stop underexposed as I usually like my plates a bit brighter. Well, the camera was already set up and there was nothing left to do but to coat another plate and mentally prepare myself for another run. When I jumped out the bus for the second time I was sweating like a hog and looked pretty much like a mad man with purple gloves. I did notice that there was a a guy and his kids who were just about to leave loading up their truck and in the back of that truck was a bike. No bike has ever looked as good and I quickly proclaimed to the man that I would love to borrow his bike for a couple of minutes in the name of art. After finding out that I was making tintypes he quickly agreed, lowered the seat and off I went. The rushing wind has never felt so good against my wet skin and I was at the camera in no time. After adjusting the exposure and releasing the shutter I folded the tripod with the camera still on it and rode back downhill with the whole setup in my left hand while steering around a large and very spread out family with kids who suddenly appeared on the path. Besides kids there were two adults texting away on their phones and I must say that as far as paying attention to the surroundings they were wore than kids - kids jumped out of the way while I had to make road runner noises just to get the phone-glued adults to notice me. 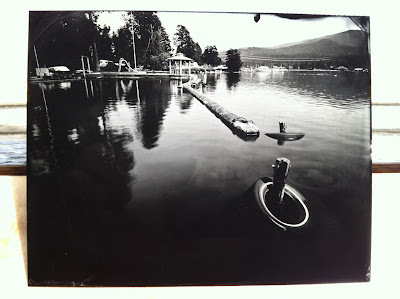 I think the time it took me to fold the tripod an the fact that on the way back the holder was no longer in a wet towel wrap meant that by the time I was back in the darkroom the second plate was as dry as the first. I again applied the developer twice and gave the same time. I think it was all worth it! Below are the results of this little story. I love both of the plates and have a hard time deciding which I prefer, but now am leaning toward the darker first one. I'll have to see how they take the varnish and give it some time to distance myself from the above experience in order to see these images more clearly for what they are vs. what I went through to make them. I thought I was done shooting for the day, so I drove onward toward Montana on I-90. It didn't take me long to notice a tee-pee and to get yet another urge to make a plate or two happen. 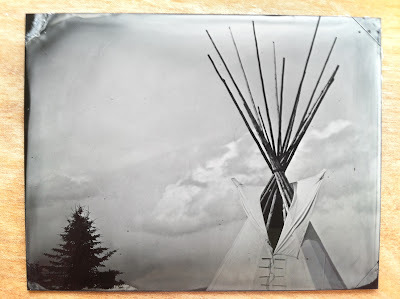 The place where the said tee-pee was placed is called Old Mission State Park and I got there just in the nick of time - it was 5 pm and the lady in charge of collecting visitors fees was seen walking away from her post. I selected a beautiful parking spot and made the following exposures. After that I was definitely done for the day and drove into Montana with a sense of accomplishment. There are no big towns west of Missoula and I didn't feel like driving all the way there, so I pulled over and slept in a little no-stop-light town of St. Regis. In the morning I stopped by a coupe of antique shops and found a great little tintype that was made in 1930s. It loos like one of those tintypes that I've heard about - the kind that was made at a local fair and was given to the people in the shot within minutes of exposure. It has a really nice paper mat with art deco design and on the back are handwritten words reading 'Ain't we sweet'. 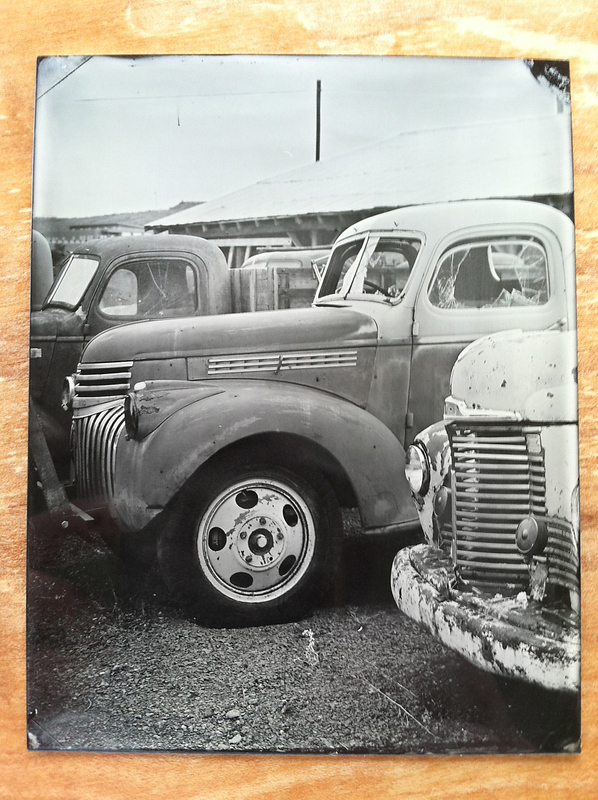 The photo is badly darkened, probably because the photographer skipped on the archival processing in order to give the image to the customer as soon as possible and be on to the next one. In the shot there are two young ladies standing by a front end of a rather large automobile. I wonder if there is a way to brighten the image back up... 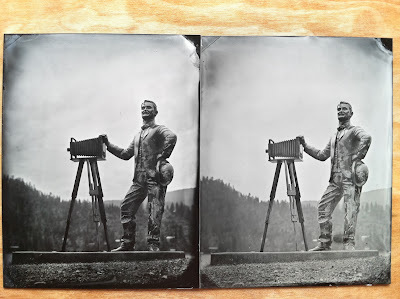 I'll have to read up on tintype conservation and restoration. The drive to Missoula didn't take long and I noticed a great little spot overlooking the city where there was a large dirt pull-off right on the side of the highway. I decided to come back there and did just that after contacting a photographer by the name of Brian H Johnson with whom I was hoping to stay for the night. Here is a plate that I got after going back on the freeway. I like how there is a letter M on the side of the mountain. There are not too many letters that can be reversed with no loss of meaning. Having spoken with Brian I met him at his place where the neighbors were having a block party. The decorations and lighting caught my eye and I decided to do it justice by making a tintype as the folks neighbors on. I think this is a Very American plate. Now it's past midnight and I should really get to bed. Tomorrow is an exciting day - I have a trip planned to Photographer's Formulary and can't wait to get up there so I can tell you all about it in the next post. 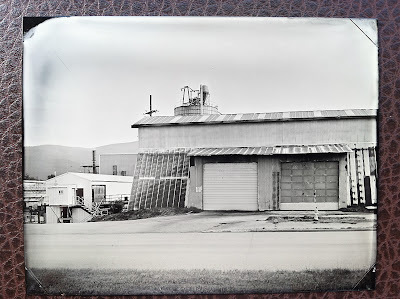 I am just east of Spokane and have a minute or two to post a quick update before pressing onward, finding a place to park for the night and varnishing all the tintypes from the past couple of days, so here it goes. Let's start in Seattle. Seattle is a place I have not been to in a while and I was pretty eager to reach it. As much as I like that city I don't think it was kind to Gilli-the-Gillig and I am not sure I'll go back there unless I have business there to attend. First off a tire was blown in a really tight parking lot turn (it would have been all good if there was not construction and a piece of concrete was not missing from the sidewalk... but I won't bore you with details) and then I tried parking in a tight spot (probably the last time I ever try doing that) and a very resilient branch has messed up one of the cool little eye brows that used to house a flashing red light. While I am hoping to find a place that may work that housing back into its original shape, the tire thing is going to be more problematic. I did have a spare, but it's brand new and the other three tires are worn. Ideally all the 4 tires in the back need to be the same height and so I am stuck finding a used tire that will match the other three. Seattle didn't have anything at all, so I am riding with no spare... In the best case it's going to cost me about $200 with the worst case (buying all 4 tires matching) $1800. Well, let's see what happens. In either case I did make a few plates there and I rather like them. Here is but one of 4 for you to enjoy. In Seattle I met with a wonderful photographer with whom I only wish to have had a chance to spend more time. 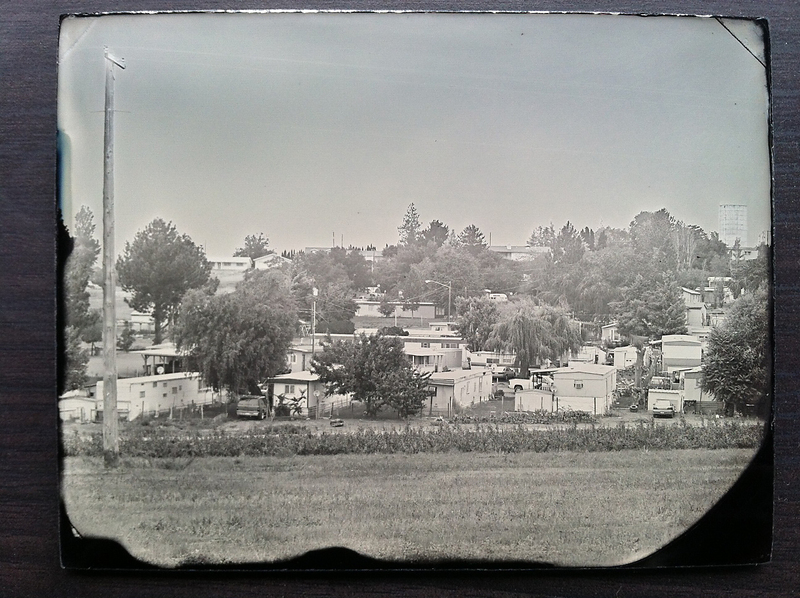 Daniel Carillo makes daguerreotypes and is in the process of building a studio, so we met in the parking lot of Home Depot where he was picking up supplies. Next time I'm in the area I'll have to stop by and see some of his plates live. I had a nice surprise at that same Home Depot lot - a random guy walked over and asked 'So, what's the story with the Gillig?'. I'm always happy when people notice the bus for what it is, but to see someone adress it directly as a Gillig is rather unusual. Turns out his father was a salesman for Gillig in Hayward CA for over 25 years and we had a nice chat complete of course with lots of picture taking of the interior. I think his dad will be happy to see the work that was done to Gilli and to hear that she could have been sent all the way to Germany, but fate kept her in USA and now she is continuing to work in education. While in Seattle I stayed with Heather Perera - one of the admins in the Film Shooters group on Facebook, a place I like to visit and post in. She shoots a lot of film and does it well, so it was really nice not only to take a load off and to stay in a bed for a couple of nights, but to converse with a fellow film-head and to also make a tintype of her and her lovely son. After Seattle I headed east on I-90. I took a few detours and followed some highways that run parallel to the main one to find some more shooting opportunities. First one came as I passed by Yakima River. I couldn't resist stopping to capture its peaceful flow. 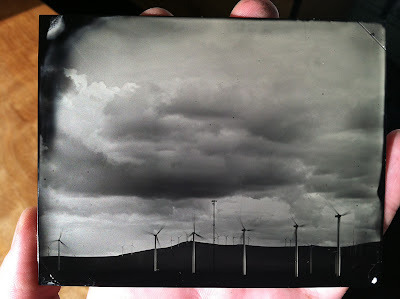 It was getting toward the evening and the clouds were really the only thing that one could lay their eyes upon on this rather desolate stretch of the highway, so I decided to pull over at a rest area by some windmills and to experiment with capturing clouds on collodion. Wet plate collodion is actually blue sensitive, so seeing clouds is rather rare and getting them to show up on purpose requires a little bit of trickery, especially if you want to get any detail at all in the landscape below. This was my second attempt and I think it worked out rather well save for some strange small black spots that decided to show up out of nowhere. 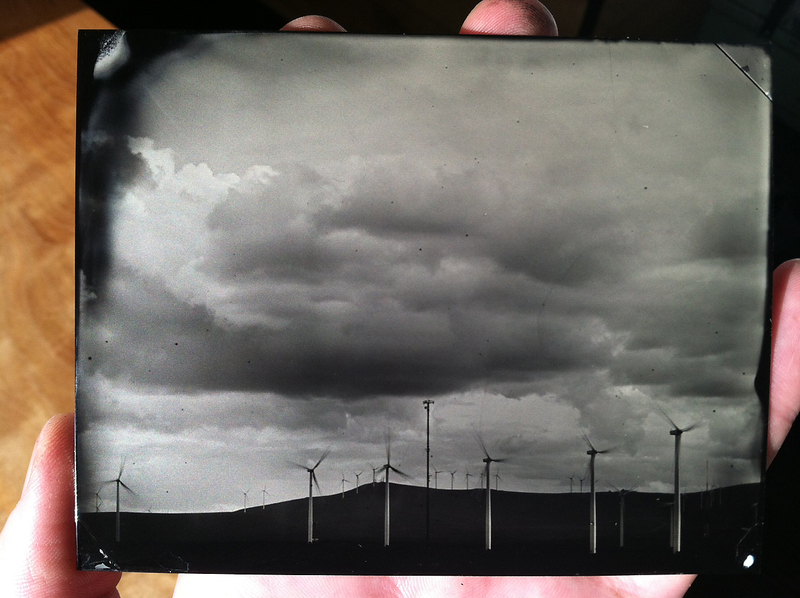 Normally I would be worried about them, but since they were nowhere to be seen on the previous plate nor on the next ones I am writing them off to some malicious collodion fairies that decided to play a trick on me. Still, the detail in this plate is rather sweet and the distant hills actually surprised me by showing a faint hint of tone. 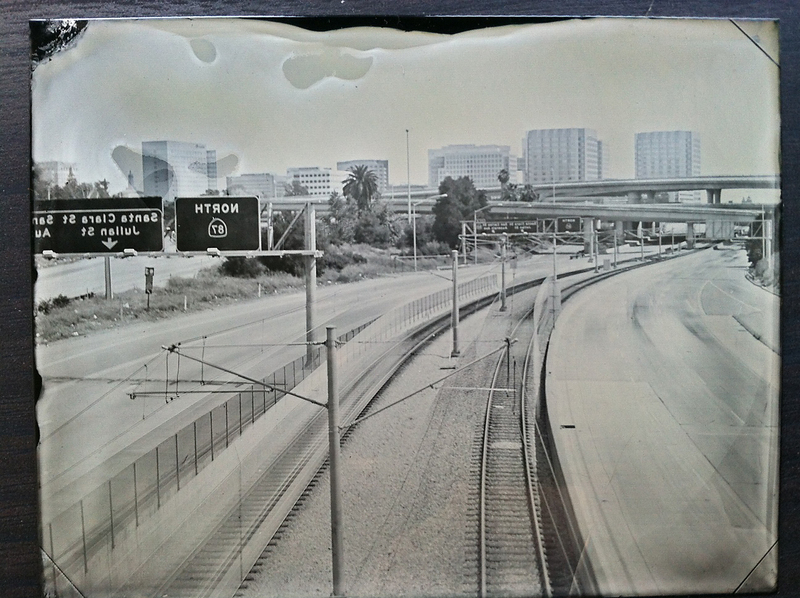 No iPhone can capture the depth of a real tintype or the experience of holding one in your hand and seeing the light play upon the surface as you tilt it back and forth. Alas, here's the best I could do. 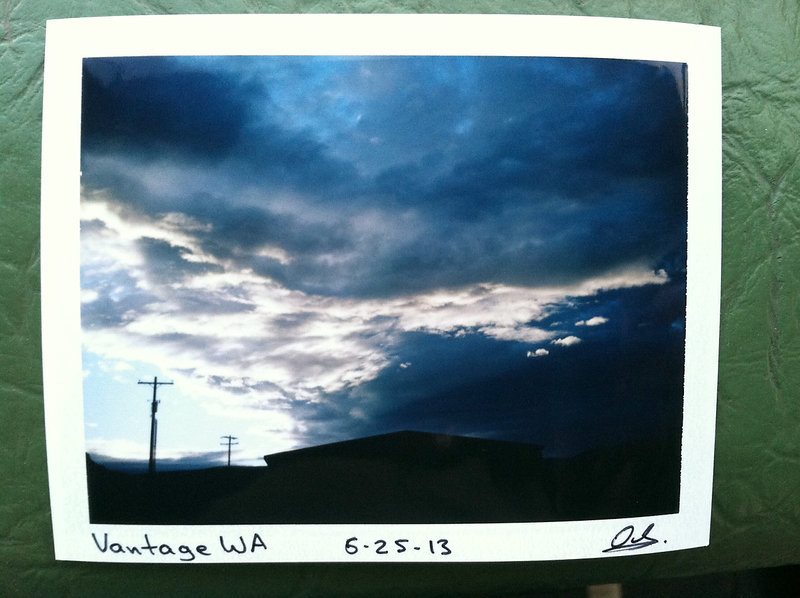 Next on the map was a sleepy little place called Vantage. It lays right on the side of the Columbia river and I decided to stop there for the night. 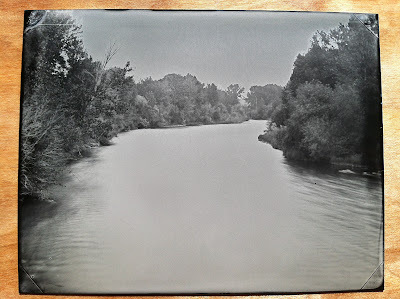 While waiting for the sun to come down I made this tintype and Polaroid. In the morning I pressed on and decided to take a longer road that eventually met back up with I-90. 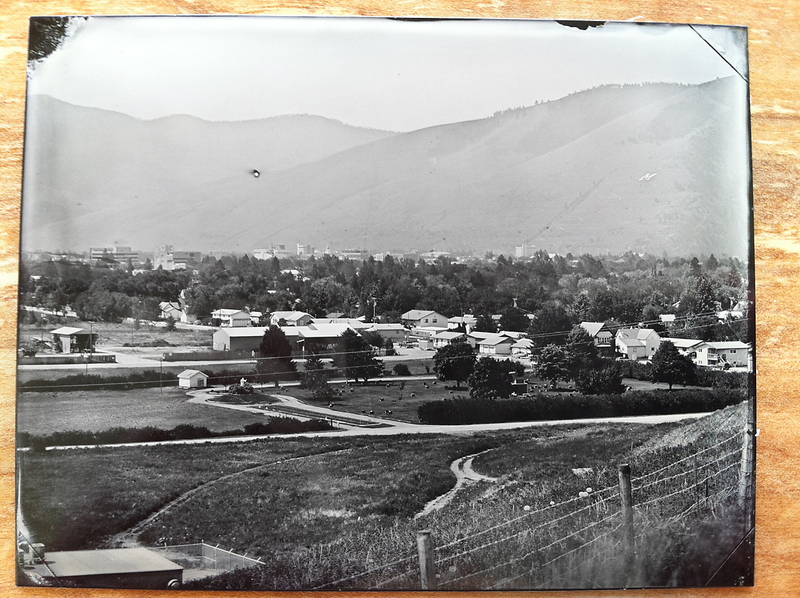 Along it I passed by a place with a grand name of Royal City - nothing could relate its grandeur more that this tintype. Next was another place with an ambitious name - Ritzville. I did not explore it too much, but here is a nice place from there. 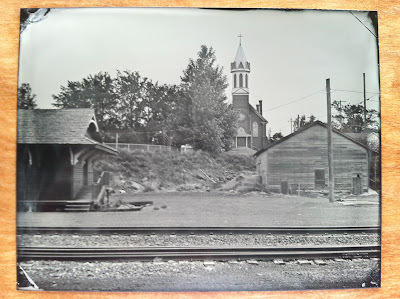 Driving on toward Spokane on 90 I noticed a town just off the highway that looked like it was full of possible shooting opportunities and I decided to pull over by a church there. 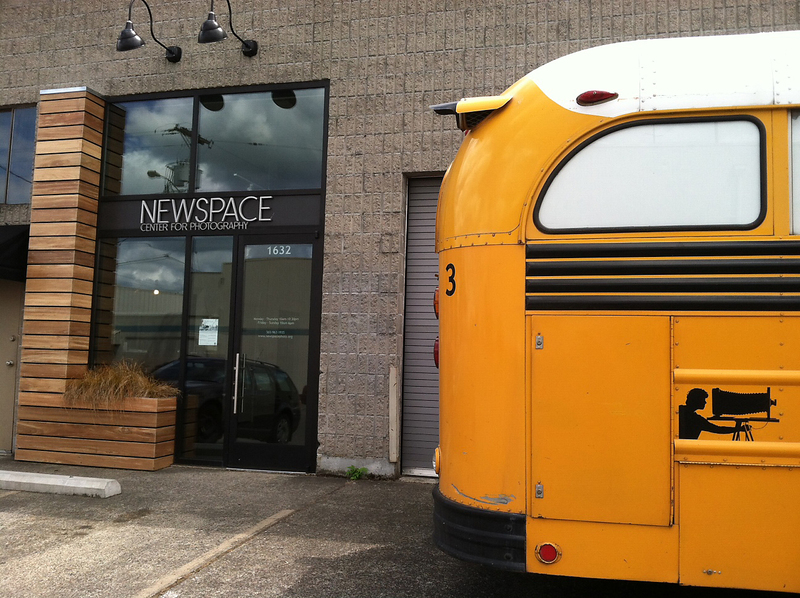 The place is called Sprague and it seems to have been completely untouched by recent history. I spent a couple of hours there with the four following plates resulting from that stay. I thought I'd type up a quicker than usual little update while I have the connection. I made it to Oregon with no big problems. The only moral setback is that while I was getting my oil changed in Redding CA by the trustworthy mechanics of Freightliner there were small bits of metal found in the old oil and the guys suggested that it's possible that the pistons in the bus are starting to go.... When I asked them how much a repair like that could cost they said that it would depend on the extent of the damage and could range from $2.500 to $10.000. I am really hoping that this is not going to have to be done for LONG time, but am now a little weary of taking Gilli all the way to Maine and then Florida. If the indiegogo funding campaign does not reach or surpass the goal I may be forced to turn back early. Also the tachometer that I might have mentioned in the previous post as having quit working turned out to have a broken cable. I really want to repair that, but I can live without it for now until I know better the state of my financial ability as that repair will cost around $400. One of the things I love while traveling is having random interactions with the local inhabitants of places I pass by. Peoples attitudes range drastically and as long as there is no harm done it's all in the name of good fun and serves as an educational opportunity for me on the subject of emotional stability and interpersonal communications. A few examples of this are as follows. A cowboy ranch owner a tree on whose property I was photographing while being pulled over on the side of the road stopped by right as I was all wrapped up and waiting for the plate to dry. He popped out from behind the bus to ask if I was broken own and needed help. I said no, but now really regretting not asking him to hold on for a portrait - his attire and face were extremely archetypal. Next time I'll think quicker. At the next place I pulled over to take a picture of the clouds (which is very much fun and unusual while using wet plate collodion as your medium). I set up my camera pointing upward, but soon noticed a portly guy on a cell phone who was continually flipping me the middle finger while leaning on his big Ford pickup truck. I proceeded to ignore him, which seemed to agitate him beyond whatever internal inconvenience that my bus parked across the street had already already seemed to cause. He started yelling and waving his hands, calling me all sorts of nasty names that are too ugly to restate here and telling me that I 'needed to go'. I did not see that as a fact of life an proceeded to make a really nice first attempt at shooting clouds in tintype format. As I was wrapping up a Sheriff showed up and said that 'someone' called in and 'anonymously' reported me and Gilli as being 'suspicious'. 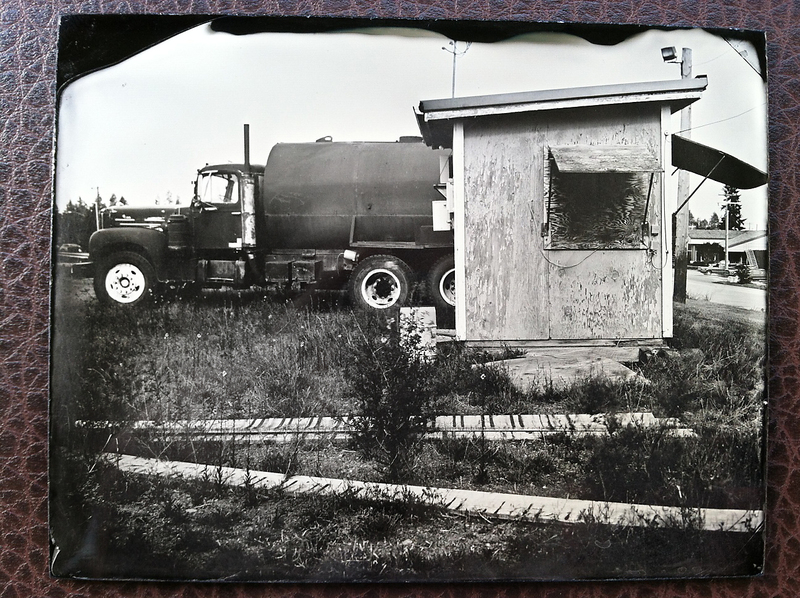 I laughed, asked the nice officer to come aboard, showed him the darkroom and the image I just made and we had a nice chat about history both visual and oral and the importance of preserving both. Next place I pulled over was a little abandoned property on highway 99. I was just planning on turning around there to go back and take a view of the road signs that I had just passed, but the buildings have provided a few opportunities to shoot and I decided to make some plates right there. 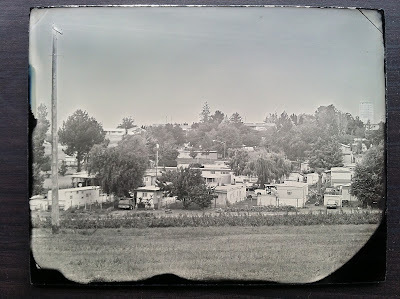 One of the shots required me to go a few dozen feet into the depth of the seemingly abandoned lot so I could shoot right over the little wire fence and across the mowed field toward the white house with an old Chevy truck in front. 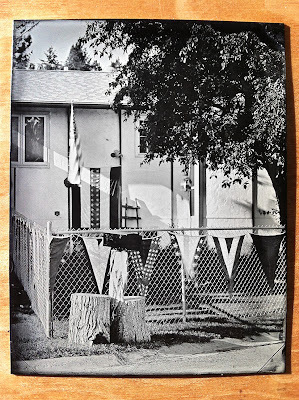 While I was under the dark cloth focusing my camera I heard a car pull up on the road leading to that house. A guy in his 40s came out and at first he seemed rather apprehensive - saying that it was his mom's house and the property was actually his and that he was pretty baffled by the 'size of the balls I must have to do this'. I explained my mission and that I'm a harmless artist and do need to sometimes cross the private property boundaries in order to reach a desired picturesque perspective. He mellowed out rather quickly and stayed for a while to observe me both working in the darkroom and taking the shots. He left to go mow the giant law, but as I was cleaning up actually came back to offer me a sandwich and to inquire about how much the shot of the house could be bought for. Unfortunately the price was too high for him, but I gave him my card and said that if he contacted me and the plate is still not sold I might be able to work out a deal seeing how it is his place and he was nice enough not to shoot me on the spot with some high caliber weapon. Some people are nice and god bless them for it. Thee is nothing one can do with people who have something stuck up up one of the go-given holes in their body and I hope they get more mellow with age and come to realize that life is too short to be pissed off at everything all the time. Those who are in between the two above categories just need a little talking to and also to be listened to and then their gentle and understanding side will come right out. Last few days were spent in Portland at the cozy home of Brandon Fernandez. He's a great guy and it's always a pleasure to see him when I'm in town. His wet plate work is superb and he makes beautiful portrait work up to 11x14in. 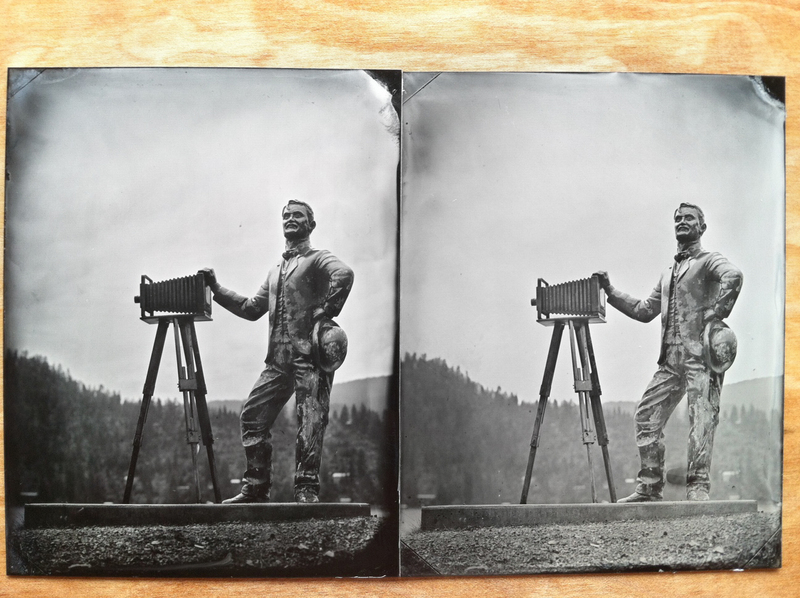 Recently he had started producing wet collodion negatives and printing platinum prints directly from those. I very much respect folks who do this process all analog and him going back to the historically original way for making negatives earns an A+ in my book. The prints are superb even having only one coating. 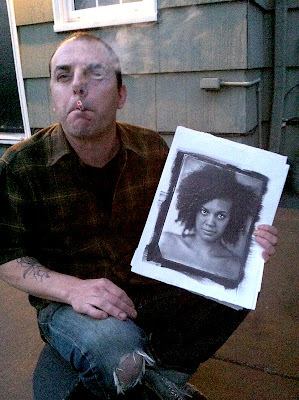 Here is the man himself on the back porch in twilight showing me one of his platinum prints. The twilight is responsible for the definitely not up to par iPhone image, but I assure you the print is great and Brandon has no grain in his face. 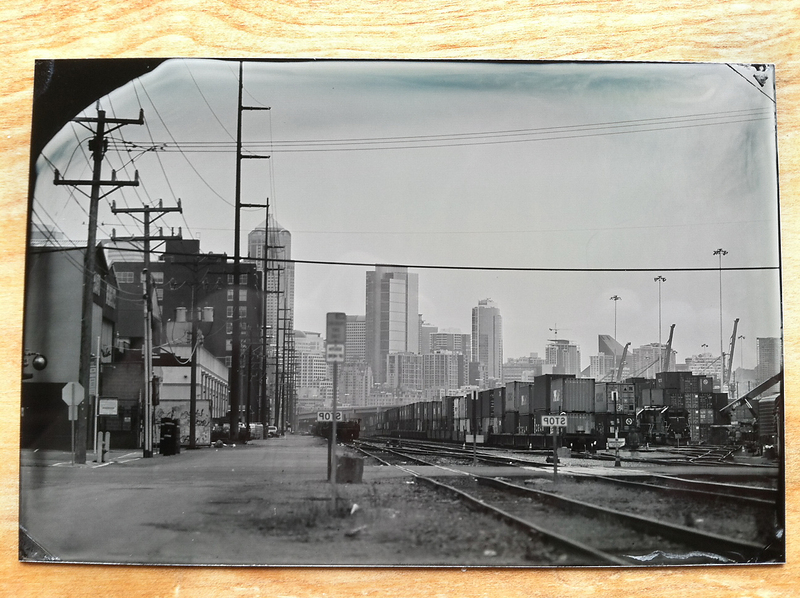 Before I got to Brandon's place I did have a chance to explore Portland just a bit and shot some 4 wet plate images. Here is one of my two favorite ones from that day. One thing that was waiting for me at Brandon's house was a new 80+ year old 8x20 Korona banquet camera which will serve as the replacement of the 7x17 that I was forced to abandon. It was a sad departure as I really felt very attached to that particular camera but I'm glad I was able to make another photographer happy by reuniting him with is and this new 8x20 will definitely do the job. It's not as pretty as the 7x17, and I don't feel any real special connection to it yet. However it's fully functional and even came with a bunch of plates, so soon you'll see some neat panoramas from it, all I have to do is secure my silver tank and find a subject that will be fitting to it. I think after a few years of service I will develop a real bond with this beast. Thank you Josh Blumenthal for hooking me up with this one! On Friday I had a print sale and Magic Lantern show at Newspace Center for Photography - a place that I have visited before and that is staffed with some lovely enthusiastic people. 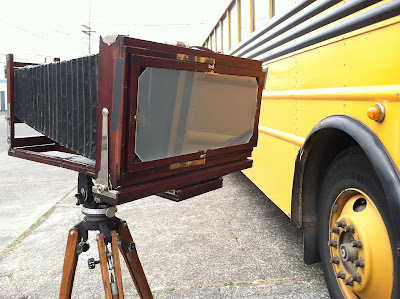 This time I also able to offer tintype portraits an as it happens did a wonderful little 4x5 of three little kids sitting on the doorstep of the bus. They were awesome models and only one of them moved ever so slightly during the 4 second exposure. 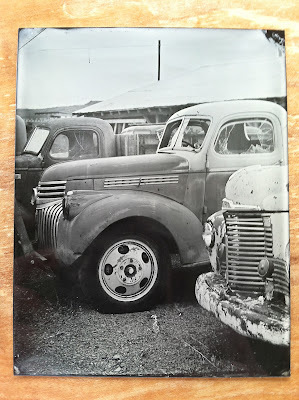 The aluminum plate was coated, developed, washed, dried and varnished very quickly as the kids were getting antsy and mom wanted to not see it escalate, so I didn't even have a chance to copy it for my records. I assure you that it was very nice (barely any wet plate artifacts on the edges with bright an crisp exposure) and now I am happy to think of yet another one of my works as having gained its own existence for many decades, and likely centuries, to come. This time the Magic Lantern Show was attended by a lot fewer people, but it was the kind of people that really is worth mentioning. One of my college friends Perry Done is studying for his MFA in Art in Portland and another ex-Spartan Morgan Chivers, who is actually now completing his MFA in Arlington TX with concentration in glass, was in town for a glass convention with his lovely girlfriend Gene. Gene was also a San Jose State graduate and so we had a mini reunion after the show, caught up on what's happening in our lives. It was really great to see both of my school buddies with whom I had spent countless hours in the darkroom of SJSU. 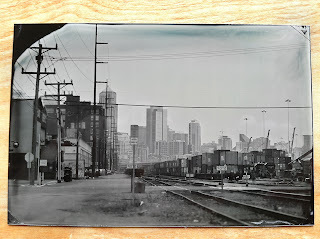 Now I'm on my way to Seattle and am looking forward to shooting some collodion images there. Hopefully I can make it to some great vantage point just west of the city by sunset and get a few good shots of the skyline. I have not been back to Seattle since 1997 an it's a shame because I remember really liking the vibe of that city. Maybe I'll even fire up the 8x20 if the view is of appropriate proportions. 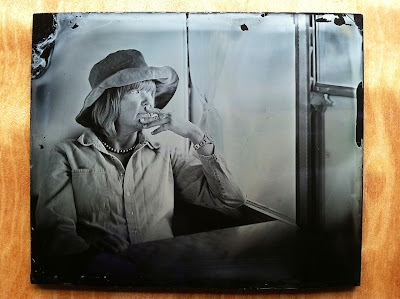 On the last day before leaving I had a wet plate experience scheduled with Chris Whitney, a San Diego photographer who is interested in doing wet plates. I don't really call my sessions 'workshops' just yet as I think I need some more personal time with the process to really feel comfortable teaching. Instead I provide all the knowledge that I have gathered so far and give people a real hands-on chance to experience working with collodion and all the fun of making images with it. 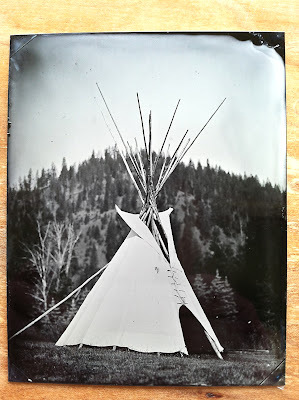 I encourage those who, after going through my 'experience', still want to pursue wet plate photography to take a workshop with others who teach it, buy books and read up on it, watch videos (though I really don't think there's too much value in seeing this process in Youtube....) and to just keep going with it. Nevertheless - Chris really enjoyed himself and he was already well versed in large format photography, so that really helped to lessen the learning curve. He brought along his Wista 4x5 and a lovely wife for a model. 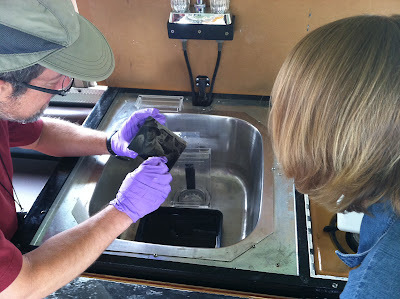 Here they are focusing the camera with me sitting in for the model, wiping off a plate and an example of a plate that Chris poured and developed under my supervision. That was his last plate of the day and I think it really came out great. On Sunday morning I had an early start as I had to be in Santa Monica by 8:45 to assist Jamie Johnson with a photo challenge. Jamie had used the facilities on board The Photo Palace Bus a couple of times in the past to make wet plate images and she is now converting one of her bathrooms into a darkroom. She also had me find her an entire 4x5 outfit with a modern lens, holders and even a Polaroid holder for Fuji film. Now all she really needs is the little stuff like tanks, trays, beakers, etc. But I'm going off-track.... The photo challenge was a pretty nifty thing - five photographers who are all a part of a Verge Photographers Collective were given a non-professional model for one hour and were challenged to create a masterpiece photograph using whatever means possible. That hour also included and make-up and outfit changes they may desire. To top it all off there was a film crew filming the entire thing and a gallery owner who was looking to dramatize it on the spot. Jamie went first because we were worried that the sun would come out and start heating up the bus and the chemistry along with it. In fact the desire of the gallery owner to add a dramatic twist was so great that toward the 30 minute mark of Jamie's shoot he decided to cut the time allotted from 1 hour to 45 minutes! Jamie was able to pull three plates and one of them was a real success - I hope she wins! I can't show you the plate as it is still top secret, but here is Gilli and Jamie's new 4x5 and the next photographer using Gilli as a background prop with the film crew scattered about the frame. Sunday evening was spent in a gorgeous location in the foothills of Pacific Palisades - a peaceful neighborhood of LA. Here is a view of the lights of the city as seen from the back yard of the house I stayed in. Doesn't LA look like some serene place you'd like to visit from all the way up here? In the morning I was shooing a portrait for the occupant of the house. She has been living there for quite a number of years and now she was notified by the owners that she needed to move and the sweet little 1970s house would be torn down to be replaced with a new 2-story one with a basement and all that... We did a really nice 8x10 plate, but in the excitement of what happened next I completely forgot to get a copy of it with my trusty iPhone. What happened next is something that only seems to happen in movies and I haven't even dreamed about. At the end of the shoot I was starting to clean up the chemistry in a small bathroom that I converted to a darkroom for the purpose of the shoot and decided to check my email. There I found a message from a San Diego museum that a curator at SDMOPA Scott Davis (whose interview you may have read on here) had given them my information. This museum was looking to decommission a camera and the email sent to me by the archivist was titled 'Early Large Format Camera'. It stated that the camera has nothing to do with the mission of the museum and that it simply had to go and all that was asked of the recipient was to arrange pick-up. 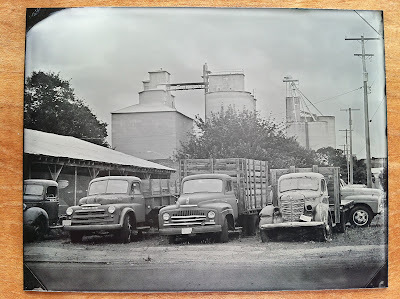 As you may have figured out by reading some of my posts I am always interested in seeing vintage equipment rescued and put back to use and so I eagerly opened one of the four attached images. After it was done downloading I nearly screamed of excitement and felt my heart pounding at three times its normal rate. Here is that picture. It is difficult to tell in this picture how big the camera is, but you must agree that it looks substantial. It is obviously a studio camera from late 1800s and that's all I needed to know. I ran, more like skipped, to inform the lady I was staying with that 'something came up' and I have to rent a car and drive down to San Diego ASAP. Within an hour I was on I-405 weaving through traffic like there were no highway patrolmen in existence. In order to make it to the museum before they closed I had to beat rush hour traffic in both LA and San Diego and that meant making it from Pacific Palisades to North Park in less than 3 hours. I made it in 2.5 with time to spare. My good friend Justin Edelman had agreed to help me out with this and we used his girlfriends SUV to head to the museum. In the lobby we were met by a lovely 20-something year old archivist who led us upstairs to the hallway where the camera resided at the time. Rounding the corner I was filled with trepidation like a young man who was about to meet his arranged marriage wife for the first time. Unlike many such men my future wife ended up being a true beauty - tall of stature and with fine sophisticated finish. At the sight of the camera (yes, we are still talking about a camera) I instantly fell in love and a bewildered smile got planted on my face and lingered on for the next few days . Here I am next to the beautiful beast with that very same smile. Now it is much easier to see the true scope of what I was faced with. The whole thing was just about 5ft tall and the wood... oh the wood.... I quickly realized that in front of me was one of the biggest studio cameras ever made - a monstrous 20x24in machine and in nearly new condition at that. 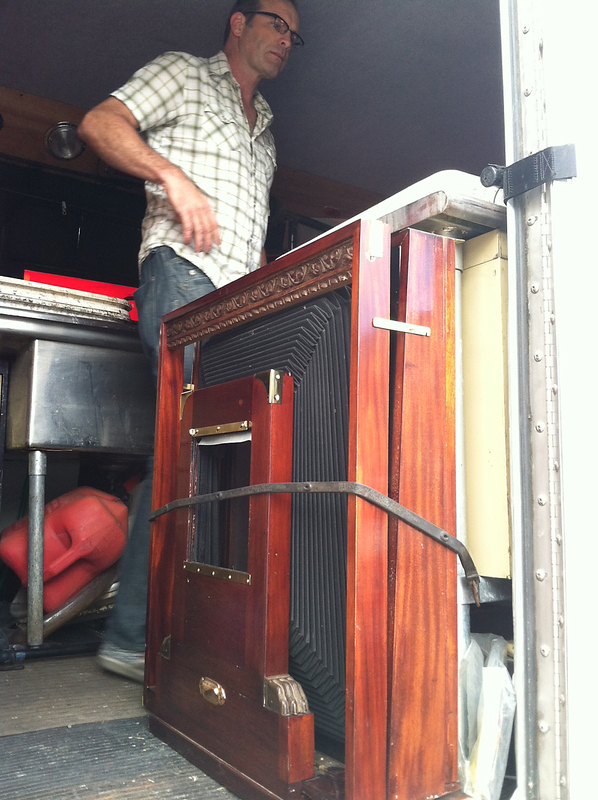 The nameplate on the front read 'The Scovill & Admas Co. New York' and the one on the rolling stand proclaimed 'E. & H.T. Anthony and Co.", I was soon told that the model is called Climax, but I'm getting ahead of myself. 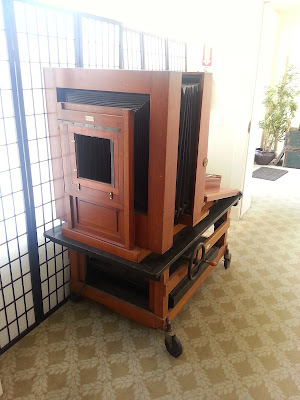 Simply getting this camera out to the elevator required taking off the cast iron wheel that raises and lowers the stand. Getting the whole thing into the SUV was a whole other challenge, but nothing that a seasoned Tertis-playing Russian couldn't handle. In the end everything including the fantastic Benster universal adjustable plate holder with a dozen nesting inserts and an 11x14 reducing back with three holders for it was safely packed and we left after shaking the hand of the woman who had just made me the happiest man on Earth (no she didn't agree to marry me, though I probably should have asked...). Now this beautiful camera is resting back home awaiting my return. 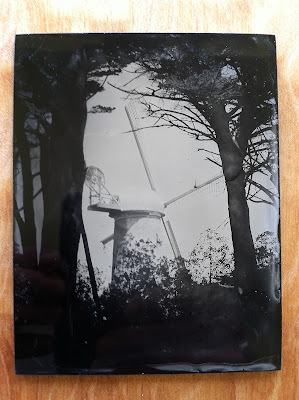 When I come back I intend on making an acrylic wet plate back for it (the original Benster back was for dry plates and though I could very much use it for wet plate photography it would be a darn shame to mess it up by dripping silver nitrate into it). What a beginning to the trip, eh? Now I really have something to look forward to upon my return! The trip must go on, as I am sure Jerry Garcia must have proclaimed many times in the 60s. I waited out the traffic and zoomed back to Pacific Palisades to spend one more might there. Luckily nobody disturbed the chemistry that was still left in the bathroom and I was able to neatly pack it all up before returning the rental car in the morning. Next stop was Ventura and the house of Luther Gerlach - an incredibly talented and knowledgeable photographer I met through the online wet plate circles. 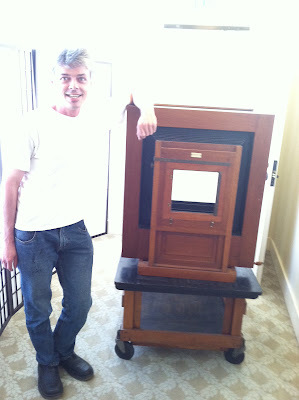 I was looking forward to meeting him for a while in hopes of seeing a few of his mammoth 20x24in tintypes live. As I keep saying - there is no way to relate something like that on any computer screen, so wanted to behold them with my own eyes. Luther turned out to be a very nice guy, someone who has been the world of alternative photography for over 30 years. I knew he was teaching classes, but I was unaware that he also frequently lectured on photography at the Getty museum. Luther had built his own 20x24 camera. He had also built a mobile darkroom in a much smaller space that Gilli, but it is every bit as functional. Here is the camera resting on just inside his traveling lab and Luther in the background by a nice stainless steel sink (which I now really wish I had installed in my darkroom - plastic is fine when you are working with traditional B&W, but when you get into alternative processes you have to deal with some majorly corrosive stuff...). We had lunch and talked wet plate and then Luther was kind enough to invite me for a short visit to his loft. There I was confronted with a collection of cameras and lenses that made me weak in the knees. The man claims to have an example of EVERY brass Dallmeyer lens made and I don't doubt him for a minute. The amount of ancient camera gear was simply staggering and I instantly felt at home. To top it all off there was a plethora of stunning photographs, both vintage and new, all over the walls and I could have spent an entire day soaking it all in visually. Toward the end of the visit I asked to see the catalog that Luther had mentioned he had upon seeing my new camera on Facebook. 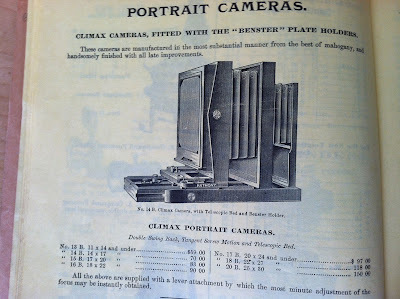 Here is the Climax camera model and all the sizes it was offered in in 1890. As you can see, historically there were two sizes bigger than 20x24, but Luther said that in all his years he had never seen or heard of those still in existence, so I wonder how many were produced and if any have survived through the ages. I bet they are hiding away in some museum basement, probably being eaten by termites or rats... As much as I love museums and the preservation work that they are engaged in I think functional pieces of equipment lose their souls when not in use and I'm glad to have an opportunity to give a second life to my most recent find. After leaving Ventura I headed north once again and reached Bay Area in just under 6 hours. I once again met up and stayed with my friend Ryan Kalem - the man who was instrumental in the purchase and construction of The Photo Palace Bus. It was rather late, so we didn't have too much time to catch up as he had to be at work in the morning, but the brief time we spent together totally brought on some excellent memories. I still wish he would someday be able o join in on this adventure, I think we have great synergy. 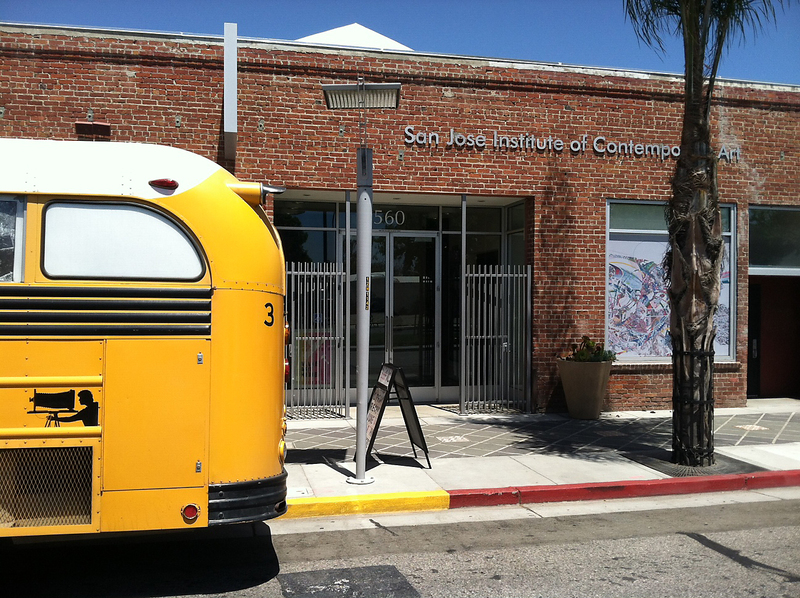 In the morning I headed down to San Jose - the home of my Alma Mater SJSU. There I visited the old lab where I spent all too many sleepless nights and was happy to find Keay Edwards, a teacher and vigilant lab tech, at his post. 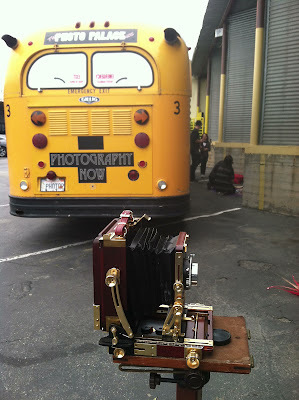 He blessed me with a 150mm process lens, which, upon my return to the bus, I found to have plenty of coverage for 8x10. Now I have a really sweet, super light and compact ultra wide angle lens. I also decided to take a shot of downtown San Jose as Silicon Valley is one of the places that California is now known for. Lucky for me my old schoolmate Mehrzad Karimabadi visited me at the location I chose to make the below image and she guarded he camera while I was coating and developing the plates. After that I drove downtown to San Jose ICA and paid a visit to the folks I used to work with so many years ago. That space is really great and the people who run it make it very inviting and vibrant. They always have great shows and I hope to work with them in the future again and again. For now it was just nice to park Gilli right in front and say hello. The next few days were spent in Pacifica at the welcoming house of Kirill Krylov who has been so gracious as to host me for the third time now. 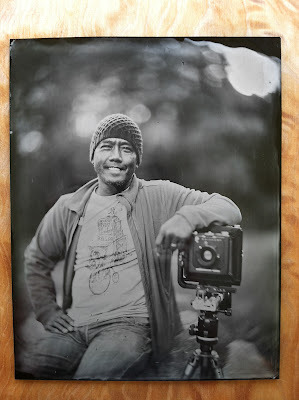 On Thursday I had planned a tintype portrait event at Golden Gate park and a few people did indeed make it and had their portraits done. 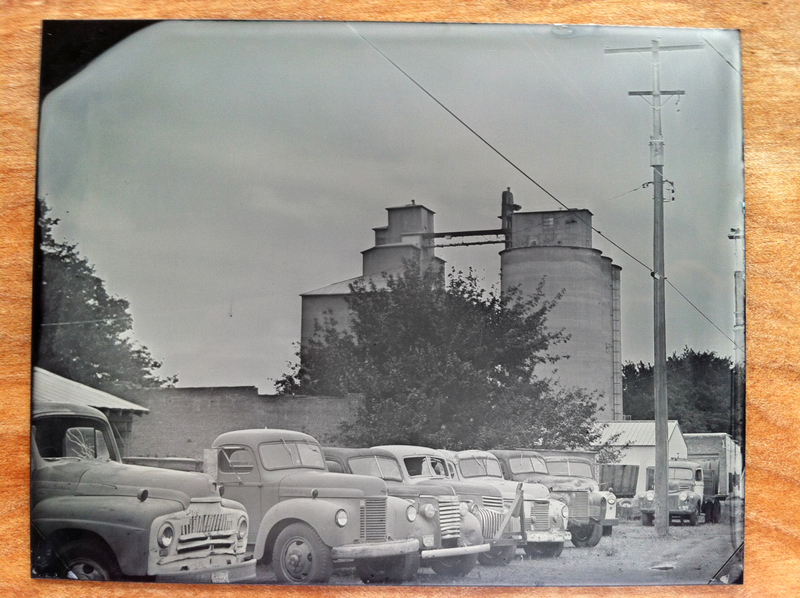 I was parked by an old windmill and I thought it was a perfect subject for my test plate. Here is a resulting 4x5 ambrotype. 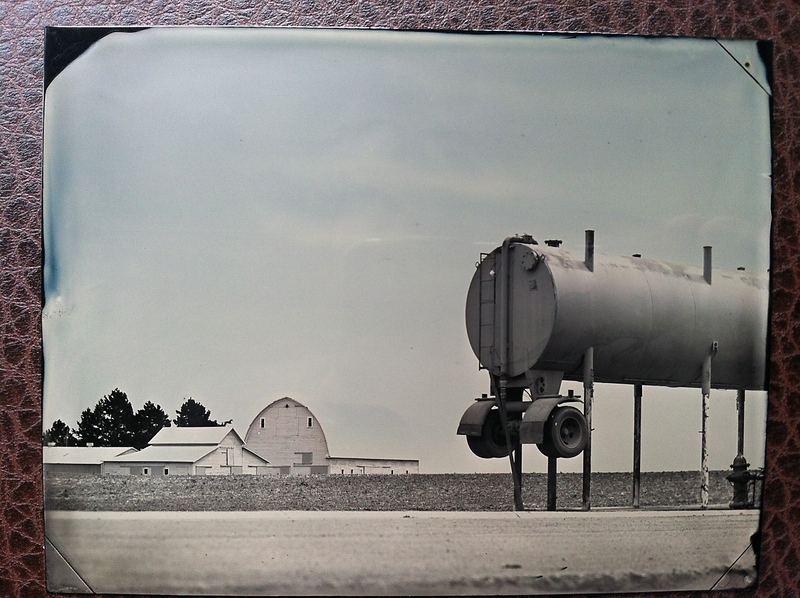 The collodion was a bit too fresh, oddly enough and unlike with regular B&W chemistry you want to let collodion ripen for a day or two after mixing in order for it to work better, so there is a little bit of fogging on in this image. One of the folks who came to see the bus on Thursday was not quite ready for his portrait session, but he did contact me later and asked to stick around till Saturday so he could pose for an 8x10. Here is the resulting image. I am quite proud of it as this was the first time that I didn't have to make a test image - the first plate worked out perfectly! From there I once again crossed the Golden Gate Bridge and headed to Sonoma county to stay with Barbara Hoffman, the woman behind the Russian Magic Lantern Slides about which you can read in a post from January. Right as I was crossing the bridge I did notice that the tachometer was dead and hanging on 0. That's not really something I like to see - this is the first thing to go wrong with Gilli in the past year and and a half. Now I am waiting for the morning when I'll take her in to a truck shop, get her an oil change and have them take a look at the tachometer. Some say 'who needs a tachometer anyway?'. Well, I do - when I drive at night the light above it is about 10x brighter than the one above the speedometer and so I pretty much drive by it - when I'm at 2400 rpm I know I'm going 55 and that's where Gilli likes to be. Let's see how many tanks of gas this little thing will set me back.... Oh yeah, when I'm on the road I pretty much think of my budget in terms of tanks of gas - nothing else matters. I have plenty of plates at least for a while (just got done cutting about 150 pieces of aluminum, plus about 40 pieces of glass) and food is very much third on the list as there are plenty of berries and fruiting trees this time of year, so if all else fails I'll be scavenging with the best of them. Pan American Wet Plate Survery Begins! Indiegogo Campaign Started and New Colloodion Images. Today I left San Diego and headed north. 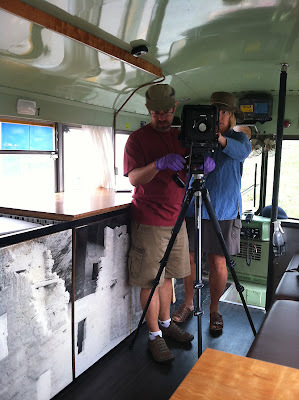 The goal is to drive The Photo Palace Bus around the perimeter of the country and photograph as much as possible using my new favorite technique - wet plate collodion. The vision is to create a modern survey of American cultural and physical landscape as seen through the eyes of this immigrant artist. 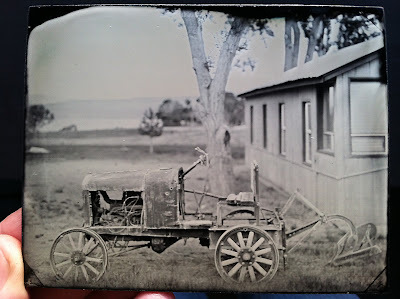 I can't help but think of 19th century photographers as Timothy O'Sullivan, Alexander Gardener and all the lesser known (or completely obscure portrait artists) who had traversed this land in their horse-drawn Tintype Saloons. Following their path is both exhilarating and a great honor. 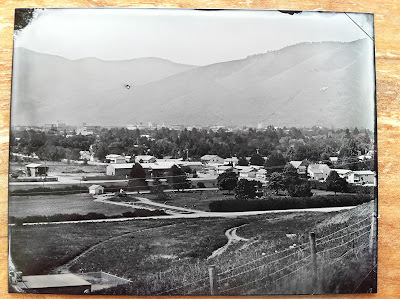 How have the people and the landscapes changed since that time? What will the road show me that will be similar to what they saw? 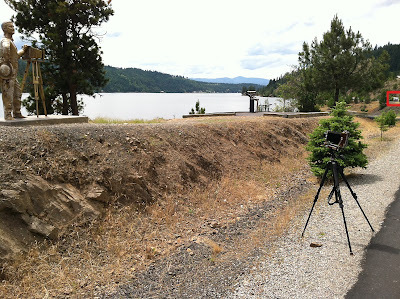 How will working with collodion work while going through parts of the country that are 100°F? Only time will tell. For now I am very excited to be in motion and to have the whole trip ahead of me. Gilli is running wonderfully, temperature in LA is perfect and the forecast is clear. Last night I launched a new funding campaign campaign on the crowd sourcing site Indiegogo. There are two goals - to cover at least the basic expenses that will be endured during this project and to distribute some of the images via perks to those who contribute. While having funds to travel will be essential to completing this approximately 14.000 mi run, having plates go out to supporters will be enormously gratifying to me as an artist as there is nothing I love more than knowing that someone, perhaps half way around the globe, is going to hold one of my images and feel its weight in their hands. I urge all who read this post to CHECK OUT THE CAMPAIGN, spread the word about it far and wide and to contribute what they can. I can not do this without You and I am eternally grateful for any help that may be offered. On a more literary note. A short wile ago I was lucky enough to get a 7x17 Korona view camera. Sadly I had to let it go due to circumstances beyond my control, but during this brief time I had a chance to make the biggest plates that I have attempted so far and got thoroughly addicted to a panoramic format. 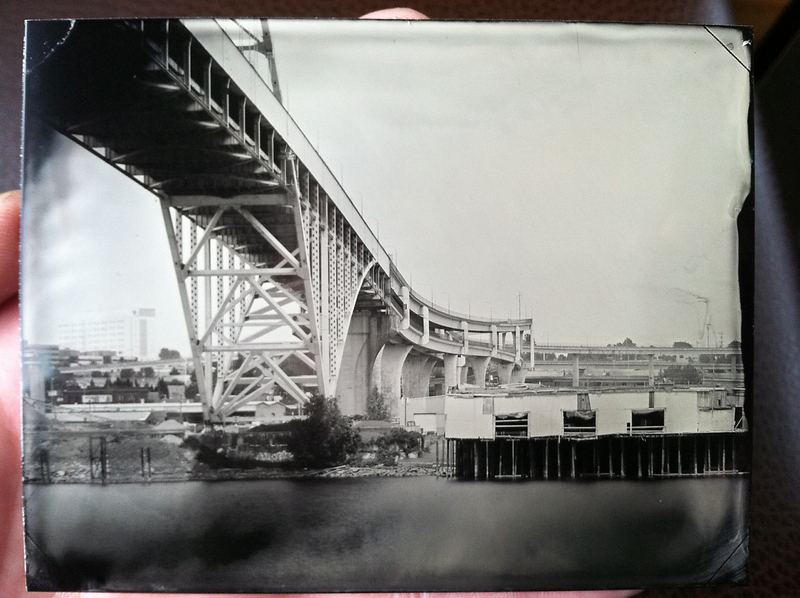 The modified plate holder was able to hold 6x16in plates and I made three successful images, which I present for your view below. The last one was my first attempt at working with collodion in a studio setting. 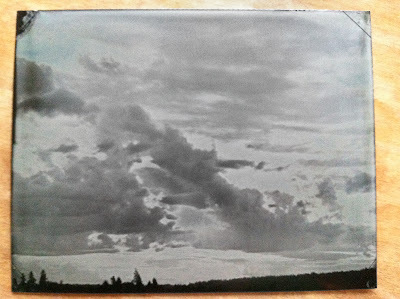 Having such slow emulsion provided some difficulties, but what is life without learning and overcoming difficulties? Contact me if you wish to purchase any of these original plates. 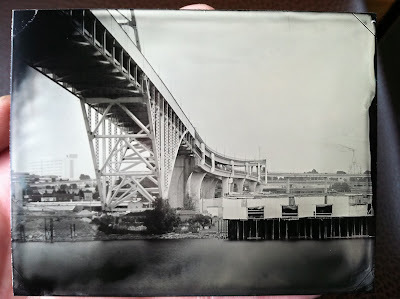 Chances are these will be the only 6x16 Ambrotypes I will ever produce (currently I am working on getting a different panoramic view camera, but it will be of a different format). 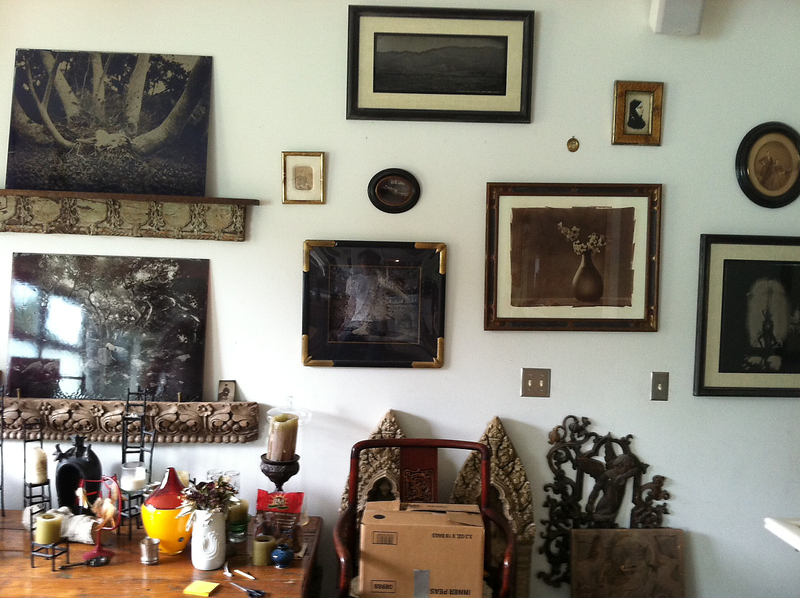 Tomorrow I am planning on meeting a very tallented photographer who also works with collodion in Ventura CA. The quality of his work has fascinated me since I saw it and I very much look forward to seeing the plates in person, interviewing him and then relating my experience to you. The Photo Palace Bus is a traveling darkroom dedicated to traditional photography. Its aim is propagation of knowledge related to historic photographic techniques through cross-country art exhibits, lectures and demonstrations.